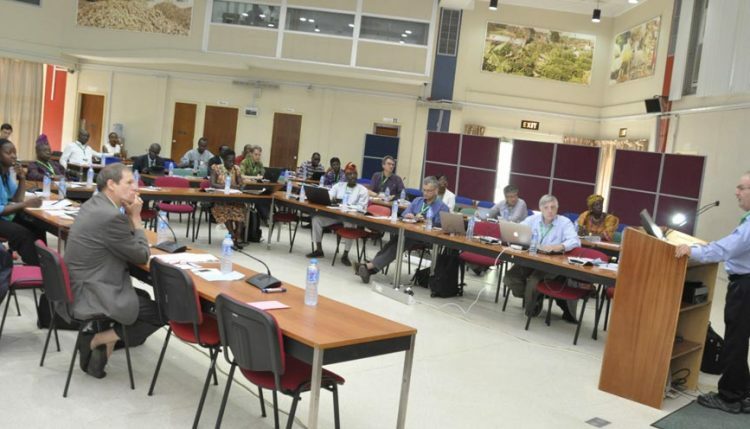 The need to improve the production process of cassava farming systems in Africa through improved methods brought together key stakeholders from several countries last week to IITA- Ibadan. The two-day workshop, which took place following a mechanization workshop organized by the African Agricultural Technology Foundation (AATF) in Abeokuta, was aimed at integrating important elements that will ensure an efficient system for the successful modernization of cassava production in Africa. Cassava Breeder Peter Kulakow making a presentation during one of the sessions. The possibility of increasing the current production rate in Africa is hinged on several factors such as the use of improved varieties, the adoption of best agronomic practices, and efficient weed control. With Africa’s exploding population, there is an increasing need to explore ways to feed the continent by 2050. The workshop themed “Integrated System for Effective Cassava Production in Africa,” took place 27-28 October, and was targeted to sensitize policy makers, developers, bankers, and scientists on ways to proactively work towards increasing cassava productivity to 30 tons per hectare. In his welcome address, the Deputy Director General, Partnerships for Delivery, Kenton Dashiell, stated that the workshop would help Africa move the cassava revolution forward. “This workshop is a big thing, and the results will help us move forward to a cassava revolution in Africa,” Dashiell said. Claude Fauquet, Director of the Global Cassava Partnerships for the 21st century (GCP21) and the organizer of the workshop, disclosed that the workshop will collect more information on mechanization adoption by cassava farmers and set the pace for the creation of a linkage that will make farmers more productive. Speaking on effective farmer cooperatives, Abu Umaru, a representative from AATF, challenged individual farmers to form cooperatives, so as to take full advantage of the opportunities available in the cassava value chain. “Individual farmers face challenges in terms of access to finance; the way out is to form cooperatives which will allow financial institutions to give credit facilities, which will facilitate access to modern mechanization tools,” Umaru stated. Alfred Dixon, Project Leader for the Cassava Weed Management Project, emphasized the need to invest in cassava as this would help Nigeria to tackle the problems of hunger, poverty, and youth unemployment. The workshop in Ibadan attracted participants from the private sector, development partners such as the Gates Foundation and IFAD, and farmer organizations.